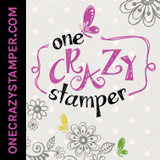 Lora's Crazystamper Blog: Welcome to my 1st Blog Post of 2018!!! Welcome to my 1st Blog Post of 2018!!! Happy New Year and welcome to a brand New Year of 2018 blog posting!! This adorable little guy is called Andy with Kite from High Hopes Rubber Stamps. I'm getting started on this year's birthday cards and hoping everyone on my list this year will get a handmade card from me. Boys cards can be a chore but I found it a bit easier by playing along with the new January 2018 Blog Challenge over on the OCS Blog. Our only Challenge was to use Purple or Blue + a ribbon or button. I managed the blue + a button and ribbon, yeah me lol. To give the image a bit of lift I put him on pop dots. The card size is 6" x 6"
These are the markers I just...missing in the picture are E00 & E04. Pop over to the OCS Blog HERE if you have a chance to see all the awesome cards for this month's challenge, I'm sure you won't be disappointed. Don't forgot to enter the Challenge too!! Love this colour combination and the buttons are perfect! Love everything about this!!!! Great design and colour combination Lora! Your card looks great!